KATHMANDU, April 26:National Forum of Photo Journalists organized a procession here Wednesday morning to mark the National Photojournalism Day. The morning procession around the theme 'Journalism for News, Photojournalism for Factual Truth' began from Bhrikutimandap. It convened at Bhrikutimandap after passing through Sahid Gate, New Road, Bir Hospital, Ratnapark and Old Bus Park. 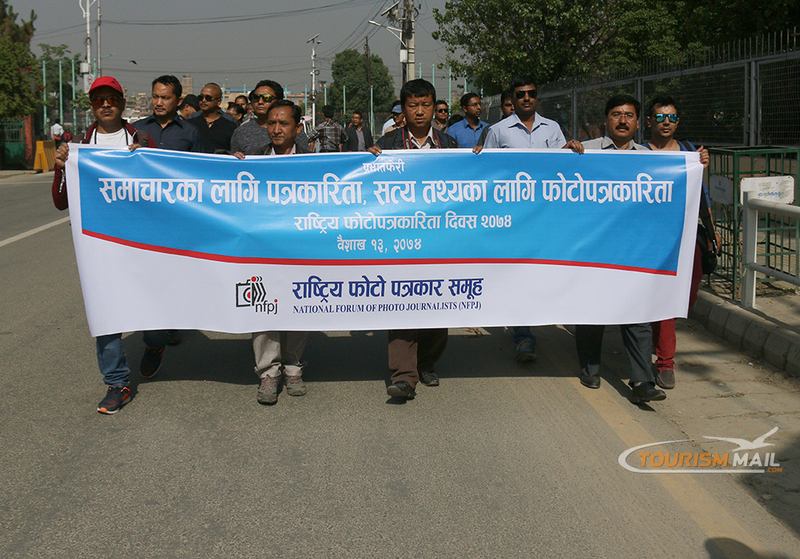 Addressing a gathering held after the morning procession, Forum President Dhruba Ale said the Forum was always dedicated to the rights and interests of the photojournalists and demanded with the media houses to provide the required number of cameras to the photojournalists working there. He also complained that the media houses discriminated against the photojournalists in terms of remuneration, and called on the state to provide identity cards to the photojournalists and insuring their cameras. Former president of the Forum Kabindraman Shakya said the importance of photojournalism was further increasing as it is an integral part of journalism in the dissemination of objective news. The National Photojournalism Day commemorates the publication on 26 April 1927 by the Gorkhapatra National Daily a photo of a girl operatinjg a spinning wheel. The photo was captioned - “Aafna kapaska bagaichama Shree Chandra Kamdhenu charkha dwara dhago kati raheki barsa 12 ki Birgunj basne Surya Mati Shresthani”. The black/white photo was published on the third page and was arguably the first news-related photo in the country. Former President of the Forum Rajbhai Suwal, Secretary Pradip Raj Onta, Parsa chapter President Pankaj Shrestha, Kaski chapter President Om Lama, Baglung chapter President Kiran Acharya, among other speakers, made their congratulatory remarks on the occasion.